You will have between 45 and 57 minutes for the PTE listening test which is the final part of the test. The actual length depends on the combination of items you get. Every test is different. In this overview of PTE Listening test, we will look at all of these important aspects that will help you to prepare. The first task for listening is Summarize spoken text. You will have 10 minutes to complete each item (question). You may get two or three of them. Use the whole time and check your work carefully. There is no advantage to finishing this section early as the time will not carry over to the rest of the listening test. The remaining listening tasks are not individually timed. You will need to click NEXT when you have finished each item. Stay calm and be aware of the time. A countdown timer appears on the top right of your screen throughout the test. It indicates how many items and how much time you have left in the listening section. As a rough guide, you will have around 1.5 minutes per item, but check the quick data table below for our recommended times. When you are practising, you always know which task you are working on, but in the real test, there is nothing to tell you that now you have finished one task and you are moving on to a different task. In order to prepare for the PTE listening test, you need to be able to recognise the different tasks. This will save time and avoid confusion for you. Note that all of the items in a task are grouped together. So, for example, once you have finished the Highlight correct summary items, you will not get any more of them. A useful tip is that if you see squares before each option, it means two things (firstly, negative scoring – see next paragraph – and secondly, there is more than one correct answer). If you see circles (radio buttons) there will only be one correct answer (and normal scoring). You need to know when to guess and when not to guess. Usually, if you don’t know the actual answer, it is okay to guess, while at other times, you should definitely not guess. In the entire PTE there are three tasks that have negative scoring – and you shouldn’t guess. One is in the reading section (Multiple choice, multiple answer) and the other two are both in the listening section. 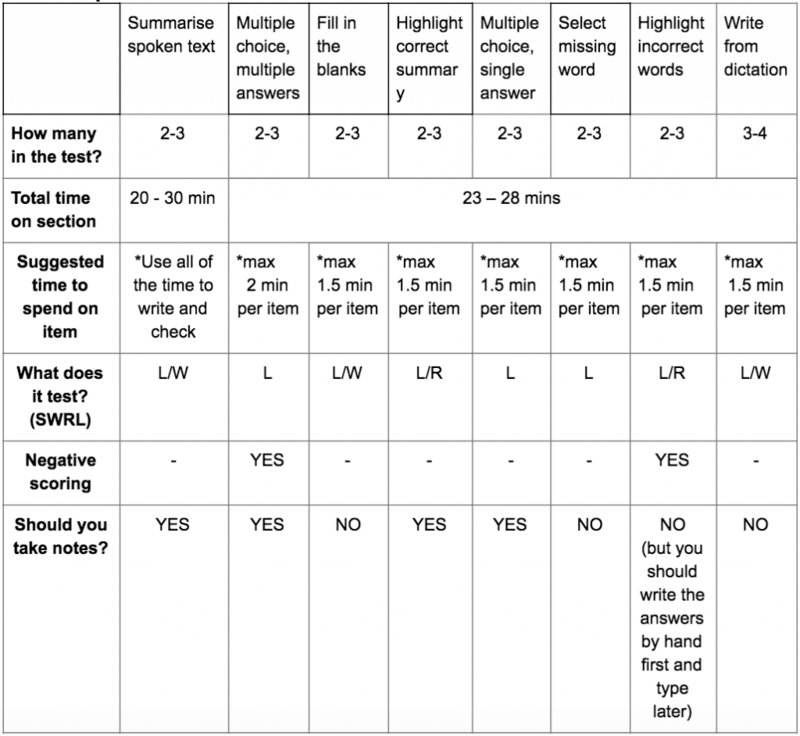 The two listening tasks are; Multiple choice, multiple answers and Highlight incorrect words. Negative scoring means that, if you get the answer wrong, you will lose an extra point. Note, that you will not get less than zero in total for any individual item. Scoring: Imagine that there are 5 answer options; A & D are correct. Something else to be aware of is note-taking. Check the quick data below to see where we recommend taking notes. Test strategies and confidence will help you in the PTE listening test, but if your communicative and enabling English skills (speaking, writing, reading, listening & vocabulary, grammar and so on) are poor, your score will not be high. You need strong English skills. 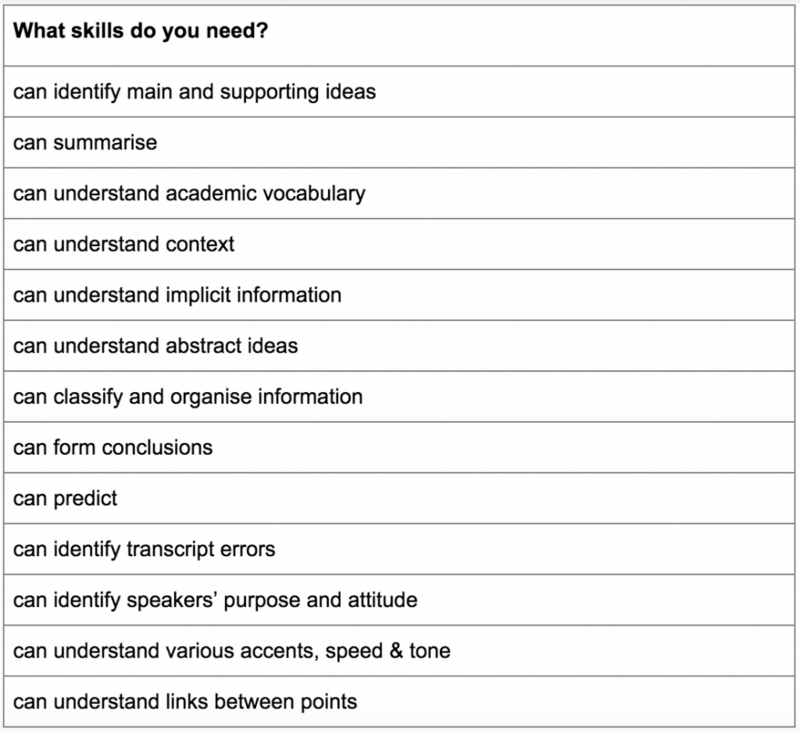 Have a look at the skills and ways to study listed below to see how to continue to develop your language skills. Mostly this will come from knowing about the task types, knowing how to manage your time and having strong English skills. Beyond that it depends to some extent on how much time you have before your test. If you plan to do your test very soon, then you need to understand and quickly recognise the various tasks in the PTE listening test and you need to know how to manage your time. SO HOW WILL YOU ACHIEVE SUCCESS ON THE PTE LISTENING TEST? If you have several weeks until your test, you also need to understand the various tasks and you need time management, but additionally you will be able to keep developing your underlying communicative and enabling language skills. You need to identify your weak areas and work on them in an E2Language tutorial with your tutor, or with a native speaker or near-native speaker of English, and on your own. Also, attend E2Language live classes for extra practice and guidance. To do well in the test, you don’t need to be perfect. You just need to be ‘pretty good.’ You need to allow yourself to make a few mistakes. You can score 90 with a few mistakes, so you can certainly score 65 or 79 despite some mistakes. Become knowledgeable about English and about the test. Check out the checklists below for skills and ways to study! E2 live classes Through your E2 online platform. You can register to attend, or you can watch them later as recorded classes. E2 tutorials You may need to upgrade your package. In these classes YOU can decide what you want to work on and our expert tutors will help you with technique and will help you to develop your confidence. use the transcripts to read and listen – good for a variety of accents stop the talk sometimes and predict what may come next notice the structure of lectures (often they use a structure like; firstly, … then … and finally … / there are several reasons for X, first, second, then, after that and finally). *When you come across new vocabulary, write it down, look it up, notice any collocations (words that are around it). Revise your ‘new vocabulary’ lists for a few minutes several times a day until you are confident about what the words mean and how to use them. Topics Note that the texts for PTE are always drawn from these areas; humanities (eg. history, art, philosophy) natural sciences (eg. geography, astronomy, physics) and social sciences (eg. psychology, sociology, economics). So, read and listen to information that is interesting for you, but also read more widely. Good luck. Do lots of practice. Attend E2Language tutorials and live classes. Be confident and exceed your expectations. Sign up now for a free trial if you haven’t already done so – at www.e2language.com – and join a free PTE listening live class. Thank you so much for your great brief details, and I am extremely happy to be with you here, and it’s a great honour for me to be one of the PTE exam students, and I look forward to your help. You are WELCOME! We are happy to have you as a part of the the E2 FAMILY! Study hard! 🙂 Remember! If you need help you can always reach out to us through the Student Help Desk!